Coordinated by Nonviolent Carbondale, our community has carried out six 11 Days initiatives around themes of peace, compassion and social justice. Each time, dozens of organizations hosted numerous programs and exhibits over the course of 11 Days with a shared focus and a published schedule. Beginning with the International Day for Peace, this year’s 11 Days for Peace will focus on empathy, humanity, and peace. Empathy gives us the ability to place ourselves in one another’s shoes. Check out the full 2018 11 Days for Peace schedule online, or Print the Schedule! Want to receive updates about Nonviolent Carbondale? Email nonviolentcdale@gmail.com to be added to our mailing list. 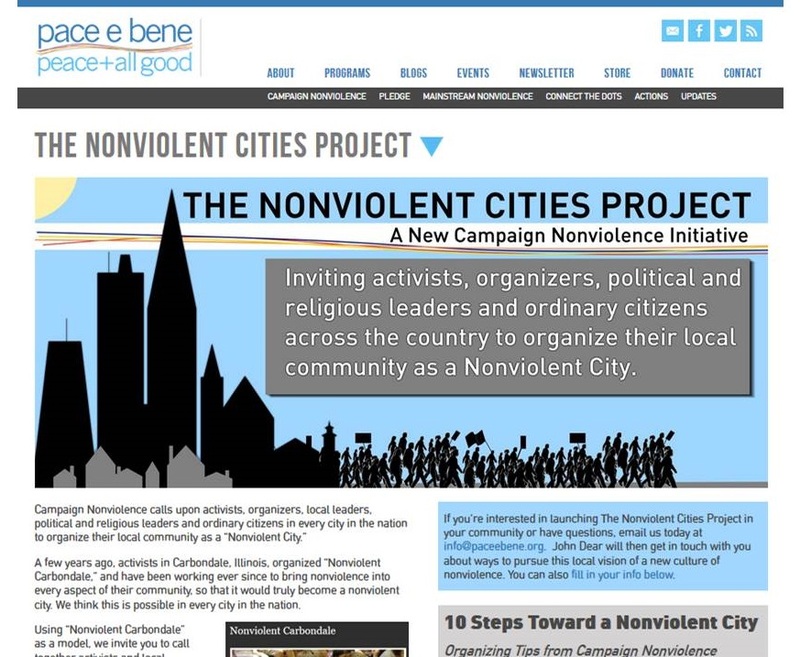 The Nonviolent Cities Project: A useful guide, and quite an honor! Author and Nobel Peace Prize nominee John Dear has launched a nationwide Nonviolent Cities Project inspired by Nonviolent Carbondale! He lists clear steps for organizing your community to address issues such as inequality, poverty, and intolerance through nonviolent cooperation. Since 2011, Nonviolent Carbondale has fostered community-driven explorations of peace, compassion and social justice issues with an eye toward joining communities across the world seeking to become Compassionate Communities. We look forward to bringing a resolution to the Carbondale City Council to consider affirming the Charter for Compassion and declare Carbondale, Illinois a participant in a ten-year campaign (underway since 2011) to become a Compassionate City. 11 Days for Peace (2011). 24 programs explored alternative responses to conflict, beginning with the ten year commemoration of September 11th and concluding with the United Nations International Day of Peace on September 21st. This created a model for Nonviolent Carbondale’s 11 Days initiatives, and launched a community-wide network striving to become a Compassionate City. 11 Days for Compassion (2012). 41 programs explored the meaning of compassion. This effort was funded in part by a grant from the American Library Association, funded by the Fetzer Institute: Building Common Ground—Discussions of Community, Civility and Compassion. The American Library Association awarded the Carbondale Public Library the 2013 national Excellence in Library Programming Award for the library’s leadership role in this initiative. The $5,000 award has been earmarked for compassionate initiatives, along with ongoing donations. Southern Illinois University’s Imagining Geographies program has also contributed financially to 11 Days initiatives. 11 Days for Food Justice (2013). 26 programs explored issues of justice, access and equity in our food systems, in partnership with SIU’s university-wide study theme for the year. This initiative contributed to the development of a winter farmer’s market, which increased access to local fresh foods into the winter season, expanded market access to new local venders, and provided a local food market in an underserved part of our community. 11 Days for Peace (2013). 53 programs focused on creating a local culture of peace. The publication “Carbondale, an Emerging Culture of Peace,” gave voice to Carbondale’s long history of peace activism, with an eye toward our present and future community. The inaugural Hugh Muldoon Peacemaker Award was awarded to community leader, and Nonviolent Carbondale founder, Hugh Muldoon for a lifetime of peace activism. The initiative coincided and collaborated with the Peace History Society Conference at Southern Illinois University, highlighting Carbondale’s efforts to national and international participants. 11 Days for Compassion (2015). 40 programs focused on compassionate action, highlighting compassionate initiatives in our community. There are many groups and individuals working to advance compassionate actions in Carbondale, seeking solutions to issues of poverty, homelessness, improved resources for marginalized populations, racial inequality, cultural tolerance, criminal justice, environmental justice, gender inequality, accessibility, unemployment, affordable housing, and more. While these issues can be viewed from many angles, all illustrate serious needs, which must be met with compassionate actions. 11 Days for Compassion (2017). 36 programs focused on compassion, dialogue, conflict resolution, embracing diversity, and placing oneself in another's shoes. Reaching an audience of over 2,800 people, these 11 Days received financial support from Southern Illinois GI Specialists/Dr. Zahoor & Sumera Makhdoom; Friends of the Carbondale Public Library; Carbondale Public Library Compassion Fund; Southern Illinois Healthcare; Women's Club of Carbondale; Walmart; and other anonymous donations. Foundations: Carbondale’s 11 Days initiatives are led by Nonviolent Carbondale thanks to an idea that originated within the City of Carbondale’s Human Relations Commission under the leadership of then president, Hugh Muldoon. Nonviolent Carbondale is an ad-hoc community group open to all. Participation: Thousands of community members have participated in 11 Days programs, while hundreds have developed, promoted and assisted with 11 Days programs. Typically, a call for programs is released, then community members and organizations submit, develop and promote their own programs and exhibits during the 11 Day period. A comprehensive schedule is posted online at www.nonviolentcarbondale.org . The schedule is distributed via printed fliers, and through local media. Download and read Nonviolent Carbondale's collaborative publication featuring 16 pages of perspectives, art, and poetry from local individuals and groups striving toward a culture of peace. Our meetings are free and open to the public. There is no official membership in Nonviolent Carbondale. If you're interested, come to a meeting! You can also visit us on Facebook. "Like" our page to stay update on events and information!